While working for a mid-size company's IT department, I noticed that most questions from "non geeks" revolved around email: unfortunately, there was no single online resource devoted to email I could send them to, especially since the same questions came back regularly, and for mostly three email programs: Sales and Accounting used Microsoft Outlook, Creative used Mac Mail, and the rest used Outlook Express. Most sites were either too technical, or didn't offer enough breadth and depth to be the ultimate reference for email tips and help. That's what prompted me to start Free Email Tutorials in 2005, and it now helps a few hundred thousand visitors every single month! FET is now a full time job, as well as managing other reference websites you may also like (listed below). There is something magical about seeing a users' eyes light up once they realize how much the program they've using all these years could do for them, and so easily! Unfortunately, people who would benefit the most from my tutorials will never get this help: I've seen countless users assume that they can't do something with their program, or give up, instead of searching online for an answer. So please refer your friends and colleagues to Free Email Tutorials! This, and other similar websites, bring information technologies within the grasp of anyone dedicated enough to regularly read tutorials: increase your value in the job market - just 10 minutes a day can make a dramatic difference in your job! Free Windows Vista Tutorials ("HowVistaWorks.com") breaks down Microsoft's operating system into small, manageable tutorials for beginners & advanced users. Free Windows 7 Tutorials ("how7works.com") does the same for the most popular version of Windows. A possible upcoming site will explain everything there is to know about Windows 8 / 8.1 - a radical change in direction for the world's selling OS! 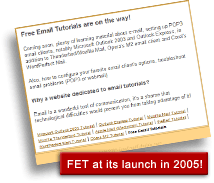 Tip: basic tutorials for Windows 7 / Vista / XP are hosted on FET, mostly those explaining email-related topics, to spare visitors from having to jump to a new site in the middle of reading! Free Facebook Tutorials covers all "non messaging" aspect of the world's most popular social network (FET includes a few tutorials relating to using email inside Facebook). Despite predictions, the social network has never truly ventured into providing an email service, even if it supports very basic webmail functionality. iPod, iPhone, iTunes, and iPad Tutorials ("iEcosystem.com") covers Apple's software / hardware "i" ecosystem, including iTunes, the iPad tablet, and various iPod models (like the shuffle and the nano). It's hard to know when, if at all, Apple will update its largest-capacity, iPod "Classic", so we're holding off on that one! Super Short Tutorials ("SsTut.com") experiments with a new approach - covering each topic with as little words as possible, designed for those who want a quick answer, as opposed to the full explanations and background information I like to give along. The brand new "One Page Tutorials" franchise extends on the idea of ultra-compact information: packing an entire topic in a single page, optimized and fast-loading on all platforms, including mobile. Our Notepad Tutorial is the first member and example! A recently launched website is "Login Tips": unlike most other sites, it is broad in scope, focusing on internet security and every online account you can think of - not just webmail providers. It covers social networks like Twitter and Facebook, how to safely sign in to various accounts from different locations, even securing your computer! My latest endeavor is "in 5 steps", another tutorial site that keeps each tutorial short by design, and explains any topic it covers in five short-but-info-packed steps! It's great for people who use tech -not necessarily by choice- and want straight-to-the-point answers without any desire to understand the "behind-the-scenes" stuff! Your feedback on Free Email Tutorials (and other sites) is always welcome! Other websites also let you either comment on individual tutorials, or send any question you have.